Dr. Esther Ngumbi is an educator, author, entrepreneur and entomologist whose research focus on understanding the mutual beneficial associations between soil bacteria and plants! Esther Ngumbi at Auburn University Plant Science Research Center Greenhouses (picture taken by Dr. Ramohhan Balusu). A postdoctoral fellow at Auburn University, Dr. Esther Ngumbi is an inductee to the National Academy of Inventors. She holds three U.S. patents for her research on basic and applied aspects of using microbial inoculants to promote growth in crops and enhance their tolerance to drought stress. Microbial inoculants are agricultural products/amendments made from beneficial microbes (tiny microscopic organisms such as bacteria and fungi). They are used in agriculture because they offer multiple benefits to crops including improving growth and protecting them from insects, plant diseases, drought and other climate change-related extremities. They also are environment friendly products.In addition, Dr. Ngumbi is a Food SecurityFellow with The Aspen Institute New Voices and has penned multiple opinion pieces for outlets such as CNN, Scientific American, Time Magazine, NPR, Al Jazeera, Los Angeles Times, SciDev. Net and World Policy Institute. Dr. Ngumbi is the founder of Oyeska Greens, an agriculture focused startup that empowers farmers on the Kenyan Coast, and the co-founder (with her parents) of the Dr. Ndumi Faulu Academy, an elementary school on the Kenyan Coast. Among the many awards under her belt, Dr. Ngumbi was also a finalist for President Clinton Global Hunger Award and was named by One World Action as one of the 100 powerful women who change the world. As this week’s #WCWinSTEM, Dr. Ngumbi is excited to share her journey as a global leader. I am an entomologist (chemical ecologist) and my research over the years has focused on beneficial soil microbes-plant-herbivore interactions as well as the chemical ecology of microbial-plant-insect interactions and bacterial-mediated biotic and abiotic stress tolerance. My current research focuses on beneficial soil bacteria. I am specifically working with plant growth-promoting rhizobacteria, which are naturally occurring soil bacteria. The cool thing about them is that they form mutual beneficial associations with plants such as maize, peppers and tomatoes. Some of the benefits they are associated with include making soils more fertile and fending off plant stressors such as insects and diseases. Beneficial soil bacteria enable plants to better tolerate extreme temperature fluctuations and other challenges that come with a changing climate. Furthermore, they help plants grow better and increase crop yields. Ultimately, my research is about understanding the mechanisms by which these soil bacteria impart all these benefits to plants. For farmers struggling to adapt to climate change, especially small-scale farmers with limited resources, an increase in yield can open fresh opportunities for the simple reason that crop sales generate cash, including money that can be invested in a range of “climate-smart” farming techniques that will further conserve water and soil, and sustainably increase production on small plots of land. As concerns about food security increase along with global temperatures, beneficial soil bacteria could be the next key tool for food security, helping farmers around the world conserve water, increase yields and improve nutrition despite the changing climate. My research is focused on finding sustainable ways to feed our expanding population without hurting our environment. First hand experiences. Growing up in my community, I saw firsthand the impact of insects on food security. Many times, our crops were attacked by insects in the field, and as a result, we would lose all the plants and harvest nothing. We also battled poor and unpredictable rainfall patterns and farmed on unhealthy soils. We worked hard but most of the time we were hungry because there was nothing to harvest. These personal experiences inspired me to pursue a career in science — especially agricultural science. I wanted to pursue a career that would allow me to positively impact agriculture and food security. Today, as a woman scientist with three U.S. patents related to my understanding of beneficial soil microbes, my research is helping farmers grow crops amidst the changing climate, and I feel humbled and happy to be contributing positively to alleviate the issues farmers face. That there would be few of us — especially women of color. That funding would also be an issue that I would have to deal with all through the science career. That straight on, I should seek for true mentors who would be there to walk with me through this journey of academia. 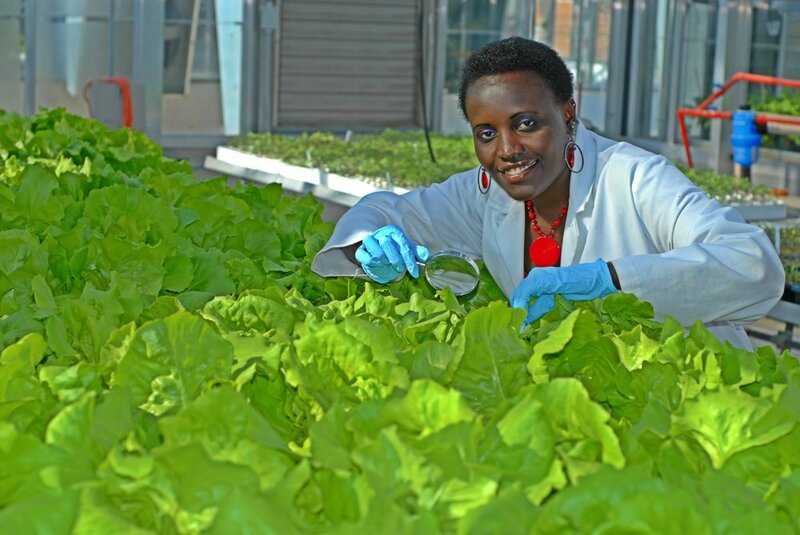 Esther Ngumbi at Auburn University Plant Science Research Center (picture taken by Laryssa Ferrara). I admire Dr. Agnes Kalibata. She received her PhD in entomology in the U.S. but now serves as the president of the Alliance for a Green Revolution in Africa. I also have a lot of respect respect for Nobel Prize winner and late professor, Dr. Wangari Maathai. I also admire every other woman of color who is making it in these STEM careers despite the many hurdles. Most importantly, I admire scientists who apply their knowledge of science to solve today’s global challenges which include hunger, poverty and climate change. I would also like to mention Dr. Laura Boykin who is not a woman of color, but I just love that her research is generating solutions to real life challenges. Her research is dedicated to helping smallholder farmers in sub-Saharan Africa to control white flies — serious pests for cassava, a staple crop. I am a passionate food security advocate and have continued to participate in activities geared towards inspiring and mobilizing everyone into taking action against hunger and food insecurity. I have pursued activism related to world food stability gaining some notoriety as a spokesperson for these issues. As a motivational speaker, I have spoken on the need to find sustainable solutions to hunger and food insecurity at several universities across the U.S. including North Carolina State, Texas Tech, University of Idaho and Kansas State, as well as in my native homeland, Kenya. I am also a strong advocate for novel solutions that research and science has to offer in an effort to grow food under a changing climate. Recognizing that climate change is affecting how smallholder farmers around the world grow their food, I have continued to offer my thoughtful opinions and have published over 50 opinion pieces in several prestigious outlets including Food Tank, The Conversation and UN Inter Press Service Agency. Through these articles, I continue to call on all the stakeholders in agriculture to continue to support the efforts to harness the innovations from microbial inoculants, because they have the potential to help create a food secure world. More importantly, as a result of continued outreach efforts with farmers in Kenya, our farm was selected to serve as the official host for the 2016 United Nations World Food celebrations for Kwale county, which has a population of over 600, 000 people. I also serve in several professional organizations, many of which are working to improve the availability of food while alleviating hunger and food insecurity. I have served as a faculty expert for World Food Prize Global Youth Institute and as a judge for the Agricultural Innovation Prize and for President Clinton Global Hunger Leadership Award. I am an advisory board member to many organizations including Soil4Climate, The Virginia Gildersleeve International Fund and Cards against Humanity. I am also currently a member of Entomological Society of America Science Policy Committee. First, growing up, I always wanted to be an accountant because they were the only positive role models I had access to. I still remember how I would go to the bank with my parents to collect their paycheck, which they would cash in to send us to school, and I would see the accountants in suits and ties and beautiful clothing, and they were all seated in an air conditioned office. I would tell my parents that I look forward to the day when I would be an accountant. I had never been exposed to a scientist for me to love science or to think that it would be an awesome career! But after high school, I was invited to Kenyatta University to pursue a bachelor of science. And once I discovered science, I never looked back. Perhaps, If I had women scientist role models as I was growing up, my love for science would have been nurtured early on. However, the more I got involved with science, the more I loved it. When I graduated with a Ph.D. in entomology, I was overwhelmed, because I realized that I had become the first woman in my community to graduate with a Ph.D. in STEM. From that day, I vowed to reach back and become a role model to many other girls/women of color so that they know that we can be scientists too. Secondly, I think there are still fewer women of color scientists in the U.S. and around the world. So, we have to positively show our younger girls that YES, girls of color can succeed in science and we need to do so by actively featuring and showcasing women of color pursuing and making it in science. Because highlighting the work of these women of color sends a positive message to the incoming scientists and we need to keep at it. 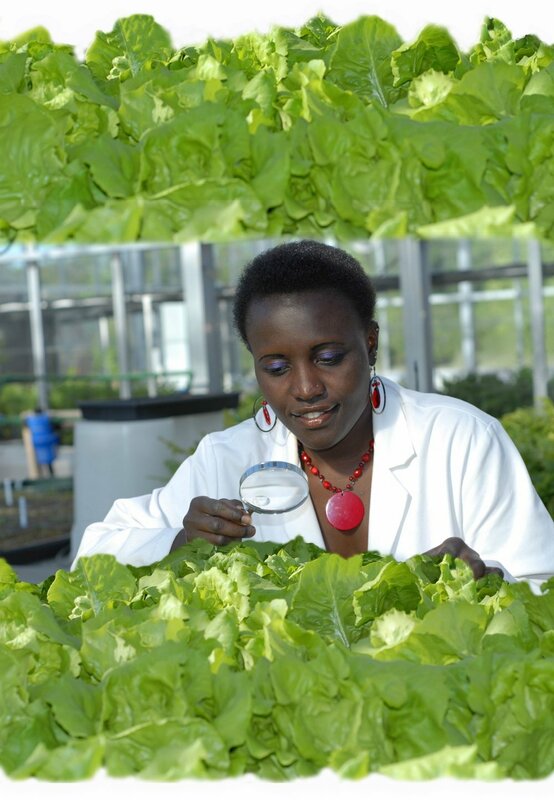 Esther Ngumbi at Auburn University Plant Center Research Center — (picture taken by Dr.Joseph Kloepper). Shoutout to the American Association of University Women, the Schlumberger Faculty for the Future and Auburn University. I am a passionate woman scientist. I love science so much that I requested that my wedding gifts be donations that could help me build a science lab that will help me inspire the next generation of women scientists. You can connect more with Dr. Esther Ngumbi on her website, medium and Twitter. Thank you, Dr. Ngumbi, for your dedication to agricultural sustainability and STEM outreach in Kenya and the world beyond! Keep up the good work and best wishes as you continue on championing for change!